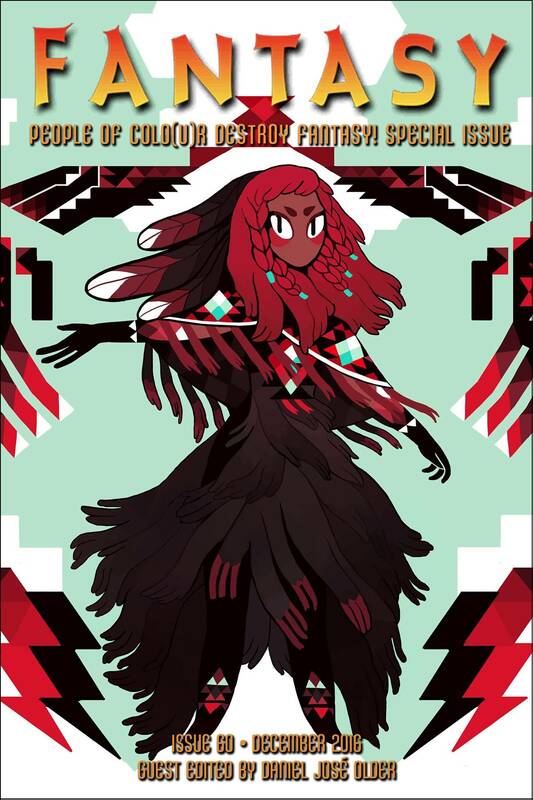 People of Colo(u)r Destroy fantasy!, our special all-POC issue of Fantasy Magazine, funded as a stretch goal of the People of Colo(u)r Destroy Science Fiction! campaign, will be released December 1, 2016. Daniel José Older is the New York Times bestselling author of Salsa Nocturna and the Bone Street Rumba urban fantasy series from Penguin’s Roc Books. He is also the author of the young adult novel Shadowshaper (Scholastic, 2015), a New York Times Notable Book of 2015, which won the International Latino Book Award and was shortlisted for the Kirkus Prize in Young Readers’ Literature, the Andre Norton Award, the Locus, the Mythopoeic Award, and named one of Esquire’s 80 Books Every Person Should Read. You can find his thoughts on writing, read dispatches from his decade-long career as an NYC paramedic, and hear his music at danieljoseolder.net, on YouTube and @djolder on Twitter. Amal El-Mohtar is an author, editor, and critic: her short fiction has received the Locus Award and she has twice been a finalist for the Nebula Award, while her poetry has won the Rhysling Award three times. She is the author of The Honey Month, a collection of poetry and prose written to the taste of twenty-eight different kinds of honey,and a contributor to NPR Books and the LA Times. Her fiction has appeared most recently in Lightspeed, Uncanny Magazine, and Ann VanderMeer’s Bestiary anthology, and is forthcoming in The Starlit Wood, an anthology of original fairy tales edited by Navah Wolfe and Dominik Parisien. She divides her time and heart between Ottawa and Glasgow. Find her online at amalelmohtar.com, or on Twitter @tithenai. Tobias S. Buckell is a New York Times Bestselling author born in the Caribbean. He grew up in Grenada and spent time in the British and US Virgin Islands, which influence much of his work. His novels and over 50 stories have been translated into 18 different languages. His work has been nominated for awards like the Hugo, Nebula, Prometheus, and the John W. Campbell Award for Best New Science Fiction Author. He currently lives in Bluffton, Ohio with his wife, twin daughters, and a pair of dogs. He can be found online at www.TobiasBuckell.com. Arley Sorg grew up in England, Hawaii, and Colorado. He went to Pitzer College and studied Asian Religions. He lives in Oakland, and most often writes in local coffee shops. He has a number of short stories out at various markets and is hammering out a novel. A 2014 Odyssey Writing Workshop graduate, he works at Locus Magazine. He’s soldering together a novel, has thrown a few short stories into orbit, and hopes to launch more. Pablo Defendini is a designer for hire. He mostly works on user experience, product design, and strategy for websites and mobile apps, with a little book design and art direction on the side. Occasionally he’ll do some illustration and some printmaking for his own amusement. You can see his latest work at defendini.com. He also gets really nerdy and technical exploring new forms for building digital comics out of HTML and CSS at digitalcomics.co. He helped launch tor.com and ran it for its first few years, before moving on to work for companies that sit in the overlap between publishing and technology, like Open Road Media and O’Reilly. Pablo was born and raised in San Juan, Puerto Rico, lives in New York City, and works with clients over the world.